Being married to Stacey Earle and a frequent hired gun for Steve Earle can't hurt you. But, these notables aren't enough to sell Mark Stuart on. The most important factor, the songs, have to be there. And, low and behold, they are. His soulful, bluesy approach to country stirs up emotions in you while his down-to-earth, honest, blue-collar voice reels you in. "Ragged Suitcase" is a sorrowful piece of Americana. Stuart's voice is so vivid; it's perfect for a storytelling number like this one. "Girl From Louisian" gets your feet tapping with Stuart's bouncy acoustic guitar and his uplifting tale puts a smile on your face. The bouncy rhythm section furthers the toe tapping feeling of the song. "Gonna Love Me Someday," which finds Stacey Earle on backing vocals, finds Stuart and company delving into some bluesy-country sure to heat things up a bit. "Small Photograph" will have you sitting back in a contemplative mood, thinking about the song, and life in general, while "It's Not Me" will have you up and on the dance floor as rock and country both come full circle for one of the most energetic tracks on the album. "Lorraine" and "When Katey Sings," the other track you'll find Stacey Earle's lovely backing vocals on, find Stuart fusing his soulful guitar and vocals with more down home country flavor. 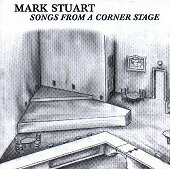 True to its family tree, Mark Stuart's debut is a keeper. It's tender songs breeze by you with both chills and warmth, depending on the song. If you like to sit down and think about your music while being entertained, here is something you'll enjoy. I'll give it an A-.